I've been quite the lazy blogger lately. Between doctors appointments, trying my hardest to continue working out every day and packing for this week, it's been challenging to sit down and type anything. Right now we are on Orlando while Phillip is at a work conference. There was no way I could stay home without him so we came along. We spent the weekend with my family and I'll be sure to post pics later this week. 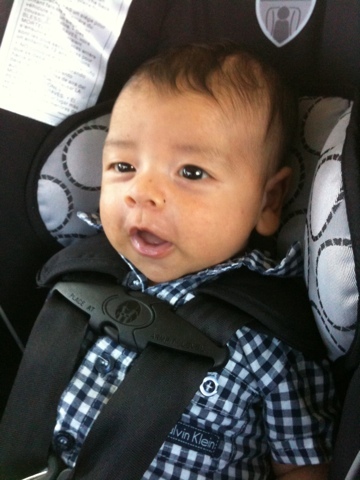 Here is a picture of the little one on his way to Mimas house. He was such a good little traveler - didnt fuss once!